Kentucky had a test of focus and maturity on its plate when Auburn came to town, hoping to prove it had learned from the lackluster efforts against Georgia and South Carolina. The Cats didn't ace the exam, but were good enough to slide by Auburn and clinch at least a share of the SEC Eastern Division title. UK (21-3, 12-1) wasn't near as sharp as expected, but used a timely second half run and a career-high 30 points and 11 rebounds by junior Kelenna Azubuike to outlast the cellar-dwelling Tigers 81-73 at Rupp Arena. Although it seemed as though UK might have been inching down a similar road to the Georgia game, the players were more willing to give credit to Auburn (12-14, 3-10) than knock their own effort. "On paper we were supposed to handle this team, but you have to understand that people always play their best game against us," senior Chuck Hayes said. "If I was an opponent coming into Rupp, I'd play my best game too. "They played hard and tough and they are better than their record shows." The Cats had a difficult time putting Auburn away, mainly because of the Tigers' three-point shooting. Every time UK seemed poised to pull away, the undersized Tigers fought back behind a three-point shot or on offensive rebound they converted to second chance points. In all, Auburn hit 12 triples and turned 21 offensive rebounds into 20 second chance points. 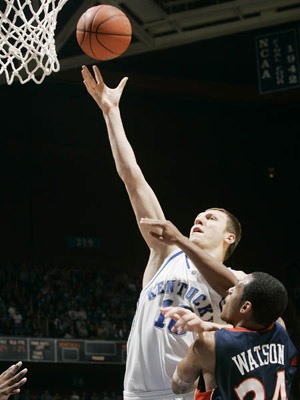 "We had trouble guarding the three and the rebounding was a little disappointing," UK coach Tubby Smith said. "I thought we did a good job challenging shots but we kept flying by people and then they'd go get the rebound. "Sometimes (players) don't appreciate how good a team is until you show up to play them." UK certainly had its hands full for much of the game. Although the Cats jumped out to a 19-10 lead in the first six minutes, Auburn responded with an 11-3 spurt to close the gap, then hung around until a Daniel Hayles putback gave the Tigers a 32-31 edge with just 2:45 left in the half. The Cats recovered to take a 36-32 halftime edge, but the fight was definitely on. The Tigers wouldn't go away quietly in the second half, pulling into a tie at 51 with 11:02 remaining as freshman scoring sensation Toney Douglas scored 13 consecutive points after being held scoreless in the first half. Sensing his team might need a lift, Smith went to the bench and found a spark in the forms of freshman guard Ramel Bradley and sophomore Lukasz Obrzut. Bradley, who replaced a bruised Rajon Rondo, swished a three from the top of the key to give UK a 54-51 lead, then added five more points to go along with Obrzut's hook in the lane to push the lead to 69-57 with 4:05 remaining. Douglas kept Auburn close by scoring 21 points in the second half, but the Cats hit 10-of-12 free throws in the final two minutes to hold the pesky Tigers at bay. "Auburn is a scrappy team and they came to play ball," junior Ravi Moss said. "It's a misinterpretation of how good Auburn is. They are not a terrible team." Like it has all season, UK found a way to get by, but it certainly wasn't a cakewalk. 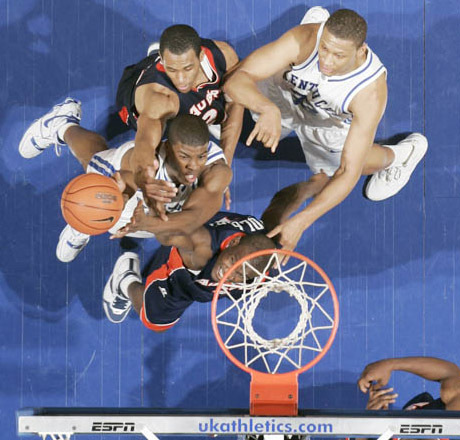 The Cats were without freshman point guard Rajon Rondo for much of the second half after he bruised ribs in the game. UK coach Tubby Smith said X-rays were done but were negative and Rondo is day-to-day at this point. The freshman had tallied three points, seven assists, three rebounds and two steals in 26 minutes of play before leaving. One of the biggest sequences of the night actually involved sophomore center Lukasz Obrzut, a player who had seen just 18 minutes of action the entire conference season. Obrzut was put into the game for the first time with 8:07 remaining in the contest and the Cats ahead 58-51. Obrzut immediately hauled in just his sixth rebound of the season and then hit a hook shot in the lane on the other end. Moments later he drilled two free throws to push the UK lead to 69-57, the largest edge of the night. "I was happy for him," Hayes said. "He works so hard and he takes more criticism than anyone I know. We are always instructing him and you have to tell him (things) several times. But he's as mentally tough as anyone on the team." It paid off for the young center when the Cats needed it most.